Hello there! Wow - I can't believe that another school year is over. It feels like every year seems to go faster than the last. I'm very proud of my son - he worked hard, and put a lot of effort into all of his school projects, and for that he was awarded Honor Roll...woot woot! But what I really enjoyed the most this year was my 4th grader talking about how much fun he was having in school. He was very fortunate to have not one, but two great teachers this year - I thank them both for making learning fun and exciting for him! 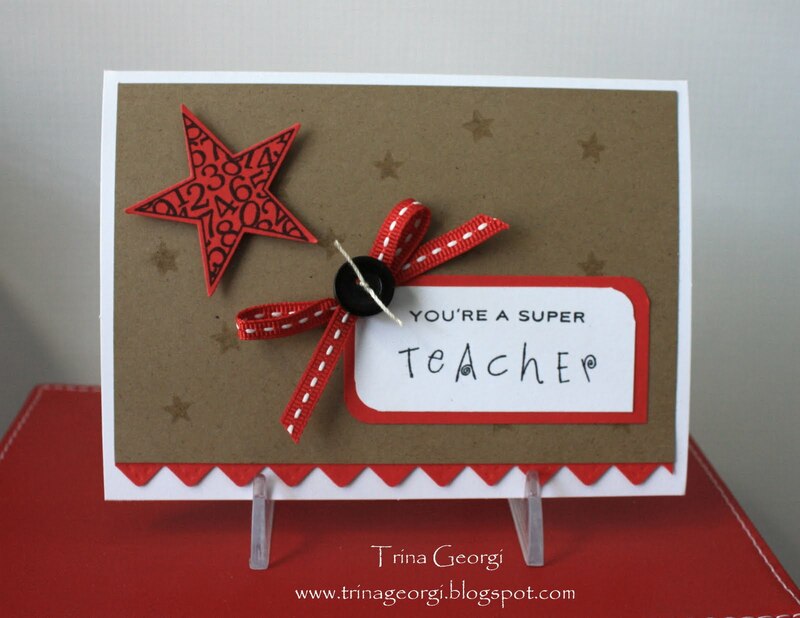 Okay...with that said, here's the card I made for my son to give to his teacher. Okay friends, it's time for me to figure out what me and the kiddies will do today. I can't believe the weather - last week was a nice, warm sunny Southern CA weekend, and this weekend is June gloom....hmmm...children's museum? movies? aquarium? What will we do? Love it, Love it! Have a fun day you all, and enjoy summer vacation!